Mankind first created music using the voice. As this sound filled the air, a listening space was formed around the singer. 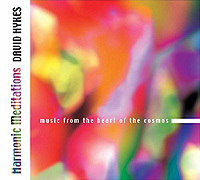 On Harmonic Meditations (71'33"), David Hykes and his ensemble of singing listeners skillfully provide us with the sensation of expanding space as well as a connection to the spiritual roots of music. On this, his tenth album, Hykes is again extending outward from more traditional forms of overtone singing. Refining further what has become a personal and significant contemporary, contemplative music, Hykes explores Harmonic Chant, a complete musical language he has been mastering for decades. This skill allows singers to explore the inherent harmonic ornamentation present in producing an identifiable fundamental vocal note. By manipulating the normally untapped resonance of the human voice, singers are able to make audible two or three tones simultaneously. Dramatic performances of this discipline are possible as the sonic and emotional range are quite dynamic. Deep resonating drones, full-throated chants and controlled wispy whistling overtones ring out individually in turn, then combine to become one ethereal sonic body. This is more than harmonious textural drone music as throughout, heavenly melodies inevitably rise out of the shifting overtones. Perhaps the most fascinating aspect of this music is how the listener attempts to associate the sound with the source which, while emanating from people, is often perceived of as unearthly. Performed in reverberation sensitive architectural spaces, Hykes' music benefits from the acoustics of large cathedrals, church sanctuaries and underground caverns. These unique spaces seem to compound the sound of each voice by providing a resonance that brings out the otherwise subtle overtones. Hykes relates the mathematical elements of harmony in music to the ordered states of the self and universe. Sacred religious art, humanity, spirituality and other influences outside the field of music also inspire his direction. His hope is to deliver into the world a simple and universal musical form which will bring the listener closer to the sacred and the reverberating whole Hykes thinks of as the Creation.